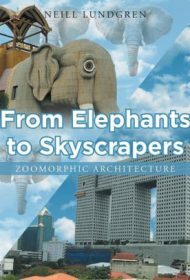 Few authors write with such unequivocal delight about their subject matter as Neill Lundgren does in her celebration of zoomorphic architecture, From Elephants to Skyscrapers. Lundgren features animal-shaped buildings from around the world and provides descriptive commentary and photographs for most. The structures highlighted in this book include museums, restaurants, performance halls, houses and more. The earthly creatures they mimic range from fish and reptiles, to birds, insects and mammals. “One of the funniest ‘winged’ animal buildings ever constructed,” states Lundgren, is the twenty-foot tall building shaped like a giant duck in Flanders, New York, from which the original owner sold “his ducks and eggs.” One of the most unusual is a research laboratory whose architecture is inspired by the tardigrade, a microscopic invertebrate that looks like a cross between a caterpillar and a Shar-Pei with a pig’s snout. Many of the structures are designed to create an extraordinary play of light, which the author notes in lucid prose. The wings of the dragonfly perched on an Oakland, California house are made of a “translucent fiberglass material so the light cascades through them, like real dragonfly wings.” Lundgren also discusses the creative and design processes used by the architects and relates them to the function and materials used to construct each building. Like many writers passionate about their subjects, Lundgren displays a desire to educate. For example, she describes how using building materials of glass bottles or tires may be employed to recycle refuge. Sometimes, however, this didactic tendency becomes patronizing, such as when Lundgren italicizes words she wants readers to learn and asks simplistic study questions (“What animal do you imagine the next zoomorphic building will resemble?”). Lundgren also frequently fails to precisely attribute ideas (“Some historians call gargoyles…zoomorphic designs”), or to provide specific addresses for the zoomorphic buildings. Despite these drawbacks, this is a fun book to browse through. Readers will appreciate the imaginative topic and the author’s immense enjoyment in it.